After a night involving his eccentric old college tutor from Cambridge and almost running over the ghost of his boss, Richard MacDuff's life takes a turn for the bizarre (and the supernatural) and he revisits an old acquaintance who now runs a peculiar detective agency. In my book reviews, I often talk about 'zing', which is sometimes quite hard to define. But if I were to choose one author's writing as the embodiment of zing, it would be Douglas Adams. I simply adore his style, and this book has it in spades. Right from the start I was plunged into a world of mystery and intrigue, with plenty of plausible-ish sounding futuristic sciencey stuff. The writing is witty and creative, interspersed with plenty of ideas and questions to keep your thought circuits whirring. The author also has this incredible knack for writing enormously intricate and multilayered plots, then feeding them to the reader one tantalising nugget at a time. I raced through this book at top speed because I simply couldn't bear the confusion and suspense any longer. Though, for me, this story's complexity did run away with it a little, leaving me equal parts impressed and infuriated. I really struggled to keep all the little details in my head, so that when the plot was all wrapped up I found myself questioning whether everything had actually been resolved. Perhaps it would benefit from a re-read and some serious note-taking. The first half of the story was, for me, spectacular. Mysterious and thrilling, the plot built up tension and suspense on all fronts, so I just couldn't wait for all the different elements to come together. I was slightly less impressed by the resolution of these mysteries, which, though they were certainly inventive, didn't quite live up to my imagination. The second half delved a little too far into the paranormal, which I felt didn't completely mesh with the first half of the story. I still enjoyed it though. And the bit with the sofa was just genius! 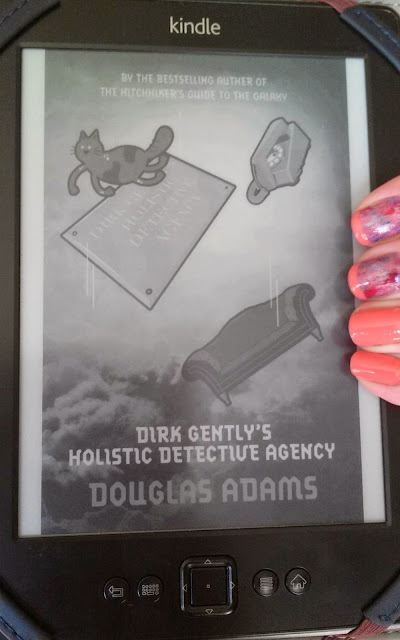 Overall, I thoroughly enjoyed this book, as much as I always relish Adams' writing. The fact that (as I only noticed afterwards) the characters are a little two-dimensional didn't really bother me, and certainly didn't take away from my enjoyment of the book. The twists and turns of the plot, and the perfect balance of the profound and the downright silly, made for a compelling and thoroughly brilliant read. What did you think of Dirk Gently's Holistic Detective Agency? Do you agree with my review? Did you manage to follow the plot? Let me know in the comments.